Ivanka Trump definitely got everyone’s attention when she showed up in a terrific black dress and matching boots at a workforce development event in northern Virginia Monday. Today I joined Secretaries DeVos, Ross and Acosta and Swiss Federal Councillor for the signing of a Memorandum of Understanding, which will build on our Admin’s workforce development strategy and encourage Swiss companies with US operations to invest in America’s workers! Thank you to the 20+ Swiss companies that signed our #PledgeToAmericasWorkers and together created NEW opportunities for 40,000+ Americans. A few other shots from the day’s event have also surfaced on social media. 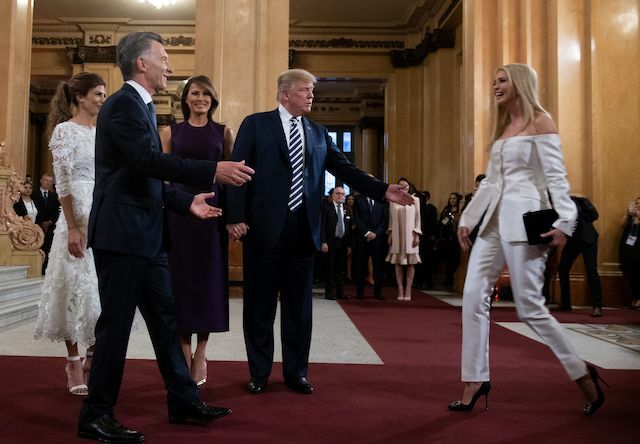 Over the weekend, Ivanka turned heads once more in an off-the-shoulder, white pantsuit, which she paired with black high heels as she was welcomed at the Colon Theatre in Buenos Aires by Argentina’s President Mauricio Macri and his wife Juliana Awada as part of an event during the G20 summit.